Put milk, sugar, egg yoke, flour and starch into a pot and cook them until the mixture stiffens. Just before it gets ready, add Elit bitter chocolate and butter. Take the pot off the stove and mix it with a blender until the chocolate melts. While it gets cooler, stir the mixture once in a while. Pour the mixture into smaller bowl and leave them in the fridge for a couple of hours. 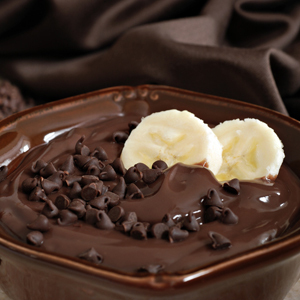 If you slice put 1-2 banana slices on the bowls, your pudding will be more irresistible.